Sharecost Rentals is your best choice for quality rentals. Rental times are based on time out, not on time used. If you have a rental out on a day that we are closed, we won't charge you for that day. Rentals cannot be returned if we are not open. Please return your rental equipment to the rear of the store. Cleaning charges may apply if the rentals are not returned cleaned. Delivery and/or pick-up charges may apply. If there is a problem with any of the equipment, please contact us as soon as possible so arrangements can be made. While every effort has been made to ensure all pricing and specifications on this website are correct, they are subject to change and error. 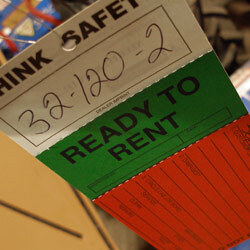 At Sharecost, we’re always Ready To Rent! Having the right tool for the job speeds up your project, preserves your sanity, and ultimately saves you money. We offer an extensive range of commercial-duty rentals for amateurs and the pros. Every piece of equipment is fully serviced and cleaned after each and every rental. Renting is affordable – most of our equipment is available in 4-hour through monthly rates. Sharecost is a family-run company that has been serving the community since the 1970s.